Candidates are being called forward from various wards in the A to E bracket to look over votes and do the vital last checks before declarations begin. Peter Kendall, who has represented Flimby on the borough council for a while says he is fairly confident and thanked the people of the village for thier support over the years. Liberal Democrat Wendy Scott said her initial response to Nick Clegg resigning was regret because he is an honourable man, but it wasn't unexpected. She would, however, like to see PR brought in in the future as a fairer system of voting. ALLERDALE RESULT: Broughton St Bridget's Nicky Cockburn, IND, 911 and Janet Farebrother, LAB 828. ALLERDALE RESULT: Boltons Malcolm Grainger, CONS, 512. Decidedly mixed night for Sherriff sisters. While @MissleeCarlisle couldn’t take Carlisle, sister @paulasherriff won in Dewsbury. ALLERDALE RESULT: Crummock CONS Anthony Annison, 636. ALLERDALE RESULT: Flimby Peter Kendall, LAB, 500. ALLERDALE RESULT: Derwent Valley Adrian Davis-Johnson, CONS, 534. ALLERDALE RESULT: Ellen - John Colhoun, LAB, 727. Louise Maguire, LAB, 560. Steve Gibbons and Mike Starkie go to the second round. ALLERDALE RESULT: Harrington - Hilary Harrington, IND, 728. Jim Osborn, LAB, 615. ALLERDALE RESULT: Holme. Tony Markley, CONS, 586. 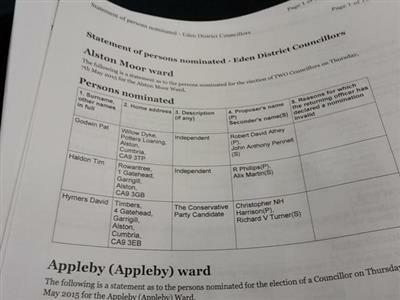 ALLERDALE RESULT: Ellenborough. Janice Wood LAB 1,050. Martin Wood, LAB, 916. ALLERDALE RESULT: Marsh - Vaughan Hodgson, CONS, 638. Hilary Harrington said: "I'm relieved it's over and done with. I'm pleased that Harrington residents put their trust in me again. Let's hope I can be worthy of their trust. We have got a lot of battles on our hands with Harrington. I think Jim [Osborn] will make a good partner too. We'll make good team. I'm pleased because I enjoy it." Asked whether she thought it would be different working alongside a party member again after working with independent Marjorie Rae, she said: "I think at local level politics doesn't really matter." Janice Wood said: "I feel brilliant. It's a relief. We were both very confident." Martin is at home ill and Janice said she was just about to ring him to give him the good news.